Atlanta Capital Funding Simply WORKS for You! If your bank is not lending, give us a call. 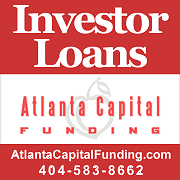 Atlanta Capital Funding is a privately funded hard money (private money) residential and commercial lender. Banks are customarily your first choice in meeting your residential and commercial lending needs, but if you require fast and uncomplicated capital, we may be a sound alternative so you can capitalize on the steeply discounted foreclosure market. We welcome investors, developers and builders and customize each loan to meet the specific needs and circumstances of the borrower. Our application process is fast and simple; our underwriting expeditious; and our solution to financing requirements creative. To begin the process, complete our application form and we will get started in obtaining a financial partner. Our Hard Money Residential and Commercial Lending division specializes in unconventional financing where speed and attention to special circumstances are critical. Our programs are structured around each client’s unique set of financial circumstances. Our program provides lightning fast service and creative funding solutions throughout Atlanta and the surrounding area.